Transtech has an integrated knowledge of governing agencies and legislation which affect project design that is crucial to a timely project completion. Transtech has experience in assisting municipalities in dealing with Caltrans appraisal and acquisition of property issues that Districts require for resident/business relocation, transportation purposes, utility relocation, and more prior or during construction. Our team of experts include licensed Professional Engineers and key staff working together with state DOTs, Caltrans, local, county and city governmental agencies, utility companies, engineering and consulting firms; helping us successfully enhance our coordination and negotiation efforts. 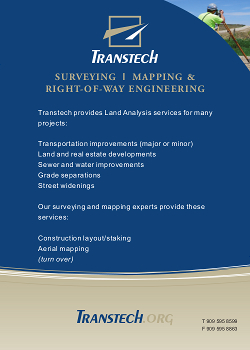 Transtech’s surveying and mapping division work together with our right-of-way engineering to develop record maps, GIS coordination, field survey work, and documentation for projects in both the private and public sectors through providing integral knowledge for successful project development.